I can’t remember who I said it to; I just remember that even with a baby on each arm, it felt surreal. I’d said the same thing before – to a running buddy at about mile 16 of the Alaska Marathon. The sentiment was similar. You’re in the midst of something you knew would be hard. You’re exhausted. Body parts hurt that you didn’t know you had. You’re not 100 percent sure you’re going to make it to the finish line. But you’re there. You’re breathing (and so, blissfully, are the babies). You’re putting one foot in front of the other. And you’re a little bit….proud. My husband and I had gone into our twin pregnancy eyes wide open. We knew it was a distinct possibility. 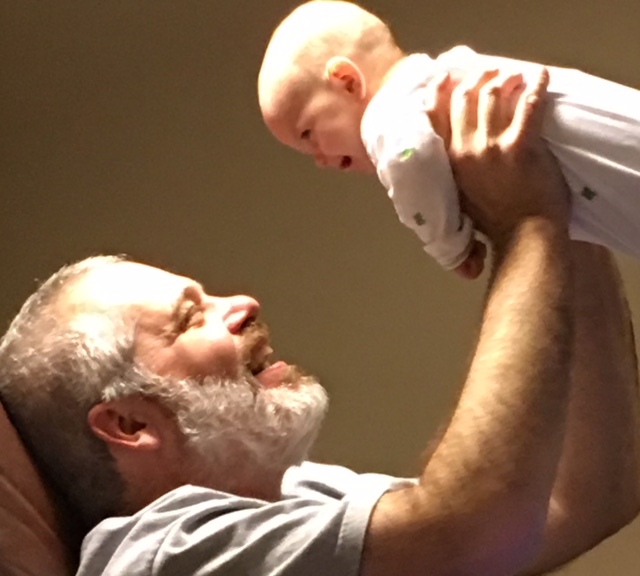 We’d come down to what we knew was our last IVF attempt – both emotionally and financially. On the big day, our doctor told us our best chance of getting pregnant was to transfer the two healthy embryos we had remaining. So we did. When we first saw two hazy blobs on the ultrasound, we were both ecstatic and petrified. 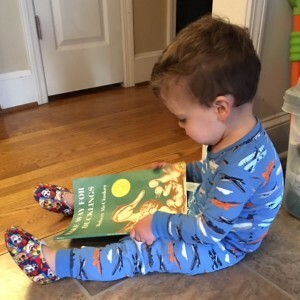 We knew what we were up against in those early months of child-rearing, or at least the half of it, because we had a son who would be almost 2 when the twins came. We are four months into this now and slowly emerging from the fog. I’m not saying my house is clean, or that I can remember where I put my phone down two seconds ago. But I vividly remember saying “We are really doing this,” that day, and I’ve been thinking lately about why. It’s not the “really” part, or the “doing,” that’s important. It’s the “we.” And the reason I don’t remember to whom I said it is because it could have been so many people. There has been a revolving door at our house. People from my church I’d never even met have been bringing meals. 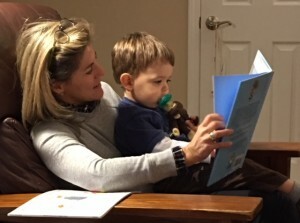 An old high school friend, who was really more of a friend of a friend, shows up regularly to read and play playdoh with my older son while I nurse. 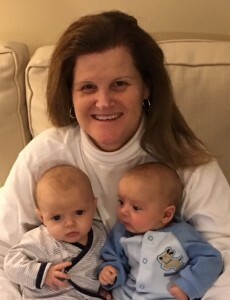 My best college friend left her own sons two hours away to help me take care of mine for a week – a week. My sweet neighbor brings her daughter over for feedings we disguise as playdates. And I’m just getting started. My mom and my sister both moved a mile away from me in within the past year so they could be close by to help. They come before breakfast. They come after dinner. If we have had a particularly rough night my Mom has come and gotten our older son so we could nap with the babies. When my husband left town for a week for work, my sister spent the night and got up with me for feedings. Then there’s the professional help. We were gifted a night nurse several nights a week for the first 3 ½ months, which was uh-mazing. We hired a part-time nanny to help me, even though I’m a stay-at-home mom, and she’s a godsend. It’s almost embarrassing to admit here just how much help I’ve had. Sometimes I’ll look around, grateful to take a shower without two bouncy seats on the bathroom floor or a chance to run out to Starbucks for my little party in a cup or some 1-on-1 time with my older son at the library, and I feel a little pang. Am I cheating the process? Is this like taking a shortcut from mile 16 to mile 24 in a marathon? Then one day I was reading “Make Way for Ducklings” to my older son. A friend had brought it to us (shocker) along a bushel of classic children’s storybooks, a few of which she read to my older son during a feeding. I’d forgotten the gist of the story, but here I was reading about Mrs. Mallard and how amazing a mama duck she is to her eight ducklings. She’s teaching them to swim and dive like pros, she’s got them all walking straight in a line in no time, and they’re all coming to her when she calls them. Heck, she doesn’t bat an eye when Mr. Mallard tells her he’s flying off down the river for a week just to see what it was like. Huh?! But then, when it came time for Mrs. Mallard to take her eight ducklings into the heart of Boston, the only way they could waddle safely across Beacon Street was because her friend Michael, the policeman from the park, had gone behind her back and called four of his cop friends to halt traffic for them. Hey, even Mrs. Mallard needed some help. Knock on wood, I haven’t required emergency personnel, not yet, anyway! And thanks to Mr. and Mrs. Mallard, I’ve decided to skip the guilt and focus on the gratitude. The fog is going to fade, but I hope I never reach a finish line. We’re really doing it? Yes, we are. How awesome is that? Congratulations on your new babies – this journey is so incredible. My twin babies are nearly 14… it goes very fast – so take lots of pictures because you really won’t remember much of their first year…. but yes… its amazing. God picks special women to raise twins and triplets… because you can do it ! hang on – celebrate the little things and take lots of pictures – before you know it they’ll be asking for a car !! Ditto what Allison said and oh hey there, Allison! We met via CMOMS, the best support group in the QC! I tell my boys this all the time – you were my gift, God picked me to have you. And you are so special, that he had to make 2 of you:-) So my only tip is enjoy the wild and crazy ride. And wild and crazy it will be. The fog will lift, you probably won’t remember much. So document as much as you can, especially the videos. What I would do to hear their baby babble again! Congrats, and thanks for sharing your journey with us! !